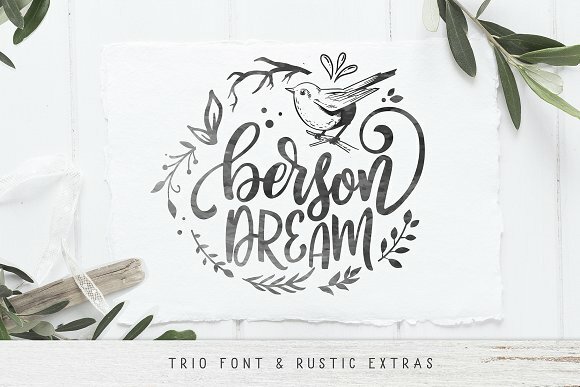 Berson Dream is a font family containing 3 complementary fonts and an extra font containing rustic illustrations. It includes lots of alternative glyphs that you can play with (more than 340!) and lots of cliparts in font format as well as EPS, PNG and SVG. Please check all lowercase, uppercase and numerals to access all cliparts in font format. The best tool if you want to create t-shirt designs, mug designs, logos or just play around. To access all OpenType Stylistic alternates, you need a program that supports OpenType features such as Adobe Illustrator, Adobe Photoshop, CorelDraw and Microsoft word. The font has PUA Unicode (Private spend Areas – font specific code), so that all the alternative characters (with flourishes and swirly lines) can be easily accessed in full through Windows and Mac and you can load them into applications such as Cricut Design Space and Silhouette Studio. A font description published on Monday, July 16th, 2018 in Fonts, Script by Andrei that has 1,342 views.